originalslope is based in New York, creating diverse, interactive projects for the fashion, art, design, and lifestyle worlds. Our service is meticulously crafted, creative ideas customized for our multinational clients the world over. Our founder, Akiko Ichikawa, has for 15 years based in New York, worked as a writer and editor, designing many projects for Japanese high-end fashion and lifestyle magazines, such as VOGUE Japan, Elle Decor Japan, Numero TOKYO, SPUR and The Asahi Shimbun. Keeping a watchful eye on both the Japanese and American markets for many years, we excel in the dynamics of consulting, marketing and press relations. Deeply connected to New York, Tokyo, and the world, we wish to help share the individuality, and inherent magnificence that each culture has, with other cultures. In 2013, Akiko conceived, compiled and had published a collection of the Brazilian illustrator Filipe Jardim’s works. From ten years of his archives, she selected around one hundred drawings, as well as sixty photographs that were published for the first time. The subjects of Filipe’s work are consist mainly of his friends, including Brazilian models such as Raquel Zimmermann and Carol Trentini. 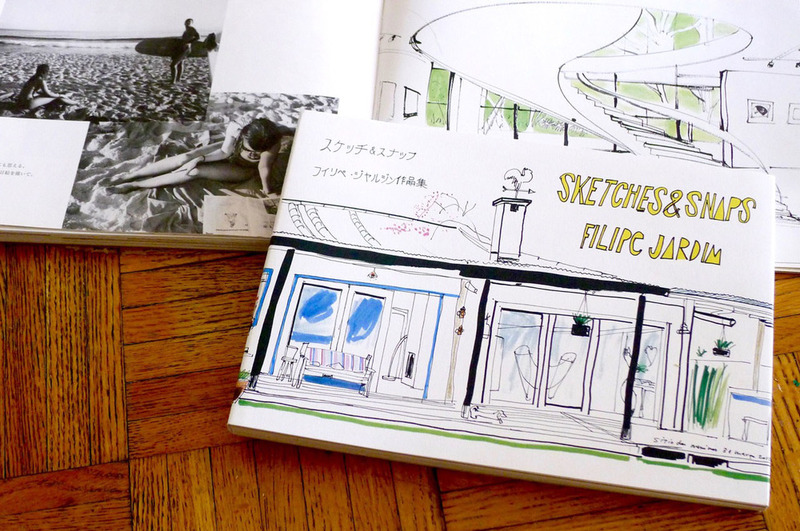 The book also includes drawings originally commissioned by Hermes, Louis Vuitton, and Paris’ Charles de Gaulle Airport. The book’s also includes his personal memos, mementos, and essays, written on his various trips to places such as Madagascar, South Africa, and Hawaii, that take the reader on his trips right along side him. The book is sold in bookstores throughout Japan, as well as Hermes’ Paris store and Marc Jacobs’ Bookmarc store in Tokyo. Akiko Ichikawa’s first book SOUVENIRS IN NEW YORK was published in Summer 2007 by Gap Japan, a publisher based in Tokyo, Japan. In this book, she wrote about 128 of her favorite souvenirs in New York. Ichikawa believes a “souvenir” can be anything that represents an original story or a piece of American culture—from a box of chocolates to a stone found on the street. Souvenirs help people share their personal experiences with family, friends, or lovers. This, she believes, is the most important and wonderful aspect of souvenirs. Some celebrities contributed to the book. For example, Milla Jovovich, an award-winning actress, recommended her favorite fashion and beauty products. Also, Hideki Matsui, former New York Yankees baseball player and ambassador for NY tourism at that time, sent his hand-written recommendation notes for the book cover. The book was sold at bookstores and lifestyle shops all over in Japan. In addition, some fashion-related stores in New York loved the book for its design, and sold the title even though all its contents were in Japanese. New Yorkers could find the book at many stylish stores including J. Crew Men’s stores, BOOKMARC (which is owned by fashion designer Marc Jacobs), and Opening Ceremony, one of the trendiest boutiques in the US. With New York as her base, Akiko writes fashion, culture and lifestyle pieces for Japanese magazines and newspapers such as VOGUE Japan, Numero TOKYO, SPUR, GINZA, ELLE DECOR, Shiseido’s Hanatsubaki, and The Asahi Shimbun. She has built a reputation particularly with her interviews, conducting high-profile interviews with figures such as Pharrell Williams, Milla Jovovich, and designers, artists, and architects such as Francisco Costa, Alexander Wang, Damien Hirst, Cai Guo-Qiang, David Adjaye, and Shohei Shigematsu. Continuing fifteen years of covering New York Fashion Week, she has been on of the nominating panel for the CFDA Fashion Awards since 2011. In 2004, 2007, and 2010, she joined judges such as Raf Simons, the former creative director of Dior, to choose the recipient of The Swiss Textile Award. In addition to New York Fashion Week, we also actively cover overseas fashion events, such as Russian Fashion Week and Greece Athens Collections. In particular, she has spent over ten years covering São Paulo Fashion Week in Brazil, and has created many plans and projects incorporating Brazilian fashion, art and architecture. Instead of traditional top-down consulting, we create innovative marketing and press strategies for our clients using our over fifteen years of experience contributing to and editing for the top Japanese fashion magazines. Reading what will become the next trends with the eyes of an editor, as well as with a deep understanding of the diversity of the Japanese market, we write marketing reports, give buying advice, and create press releases that speak directly to their targets, helping people move into and expand in the American and Japanese markets. We help to introduce the fresh brands, designers and artists of New York, Tokyo as well as the top creators of Brazil. Before coming to America, Akiko worked at Impact 21, where she was involved with the advertisement and marketing of Ralph Lauren’s women’s wear line. She also worked on compiling coordination manuals for loans, seasonal campaigns, advertising slogans, and sales promotions. With our base in New York, roots in Tokyo, and deep connections to Brazil, we create projects that bridge the divide between these places, and between the rest of the world. © 2019 Akiko Ichikawa. All Rights Reserved.